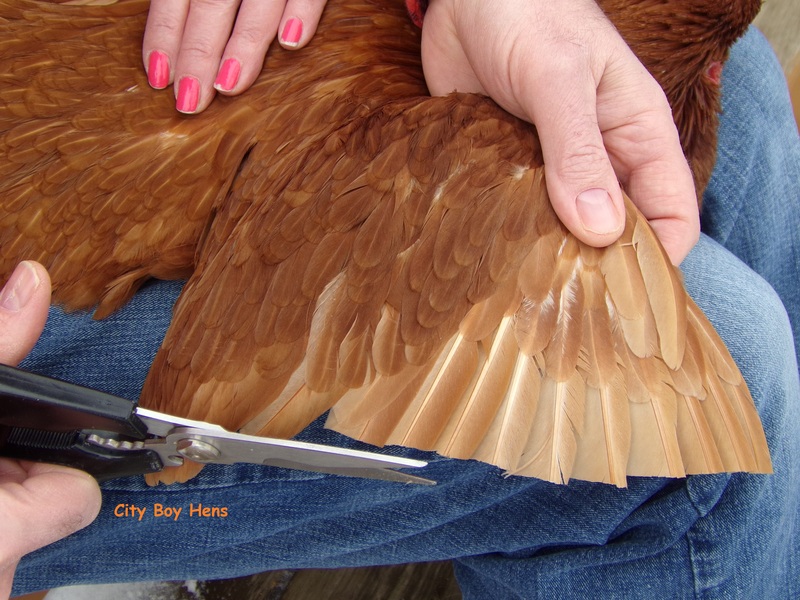 The decision to clip your chickens’ flight feathers will need to be addressed by the time they have become fully feathered. Before raising chickens, I never knew that they could even get off the ground. It wasn’t until Honda & Swiffer were around 14 weeks old that I discovered that chickens could fly! The definition of flight is somewhat limited for a chicken. It is not characterized by long bursts of flapping wings that defy gravity for great distances. Rather, it is short bursts of upward thrust that can propel the chicken forward or upward for brief periods (seconds) of flight. An example of this could be the chicken’s ability to fly up to the top of a fence or gate. Swiffer exhibited this ability at a young age and could easily perch on top of the 5 foot gate in our backyard. Since we live in the City and I do want the hens to be able to free range at times during the day, I needed to “clip their wings”. As I have said in previous pages, it is essential that your chickens do not pose any inconvenience to your neighbors. This is especially evident if you live in a city like Toronto which bans backyard chickens The last thing you’ll want is to have your chickens fly over to your neighbor’s garden and begin snacking on his/hers prized vegetables or flowers. No amount of eggs is going to make up for this destruction and “I’m sorry” isn’t going to provide much comfort to a neighbor who has worked hard to grow these crops. The term “clipping wings” is misleading because you are not actually “cutting” the wing. Instead, you are trimming the 10 primary feathers back to half of their length. This is easily done with a large pair of sharp scissors. You will easily recognize these feathers because they are the first 10 feathers on the wing. They are also longer than the secondary feathers because they are used for propulsion. I have found that this job is easily performed with the help of another person. Your job will be to put the chicken in your lap and spread its wing to a full extension. In doing so, you will easily recognize the 10 primary feathers. Your assistant’s job will be to firmly hold the chicken in your lap. 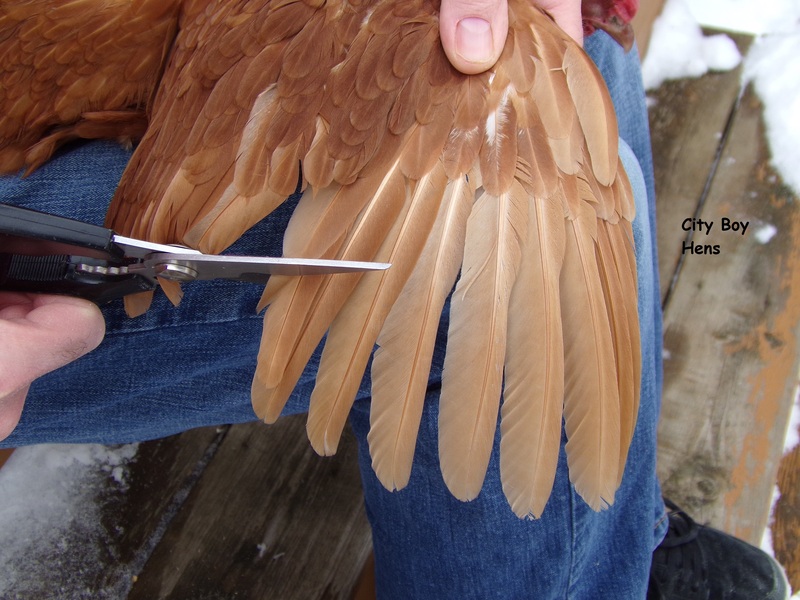 The last thing that you’ll want is to potentially injure your hen because she is trying to flap her wing while you are in the midst of trimming these feathers with a sharp pair of scissors. This process is completely painless to the chicken and she will look no different after the “trim” because these primary feathers are hidden when the wing is folded. 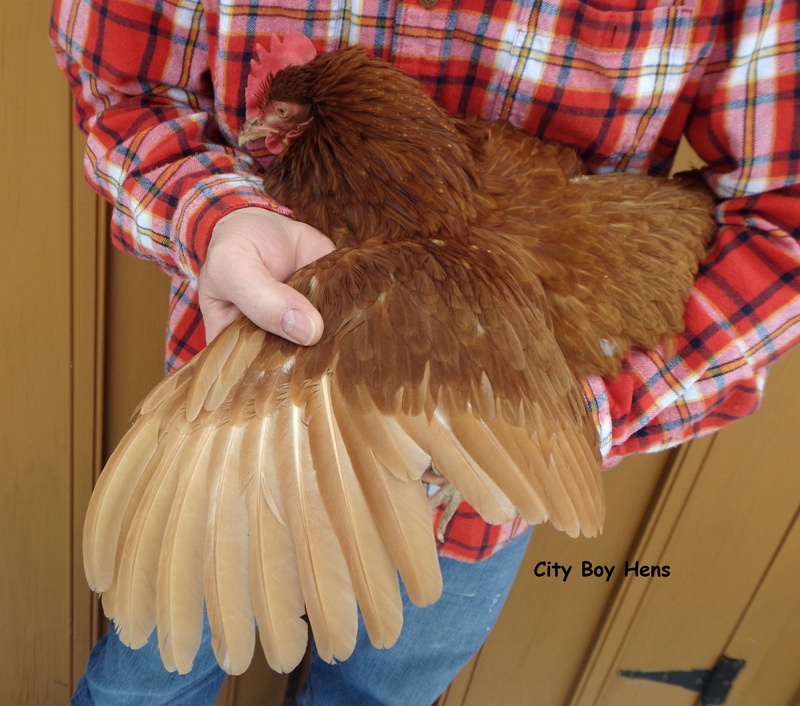 I did a lot of research before trimming my hens’ wing feathers. The general consensus was that only one wing needed to be trimmed. The rational for this was that one trimmed wing would throw the chicken off-balance and prevent flight. I followed this advice, but found that Swiffer could still propel herself upwards and, once again, had no trouble roosting at the top of the gate. Honda, on the other hand, no longer exhibited “flight”. My “non- expert” opinion says that Honda was more developed than Swiffer since she was closer to sexual maturity and nearing her time to begin laying. As I wrote in a previous page, Honda started laying at week 18, while Swiffer didn’t start until week 30. As a result, she was heavier than Swiffer and not able to get much “lift-off” by week 14. Hence, one trimmed wing was enough to prevent flight for Honda, but Swiffer required both. 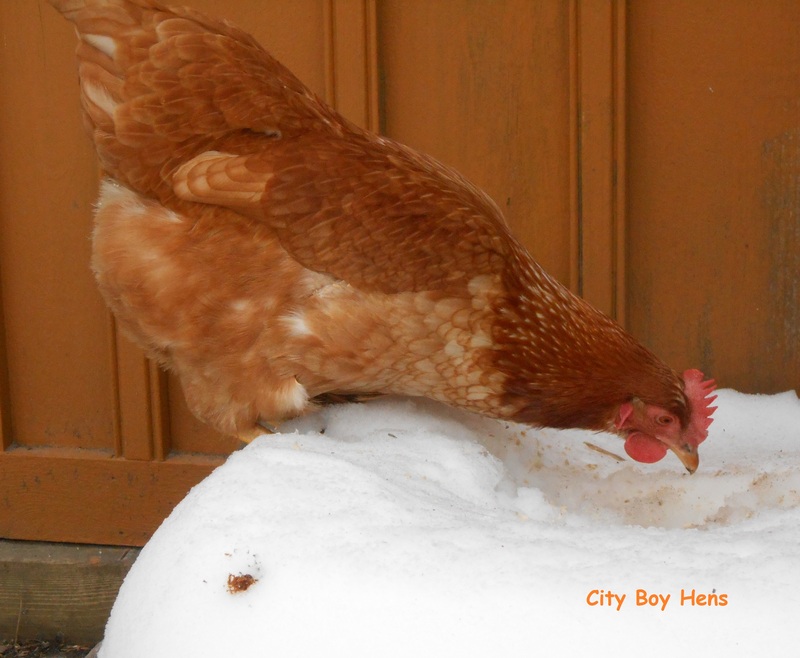 As I write, my hens are approaching 1 year of age and they will molt within the next year. At that time, their primary feathers will fall out and be replaced with new ones. These feathers will have to be trimmed again. At that time, I will only trim one of Swiffer’s wings and see if her “matured” weight helps to keep her grounded. I will let you know what I discover. The decision to “clip” is entirely yours. I have weighed the pros and cons and am very much aware that flight is a chicken’s primary defense against predators. I do what I can to supervise free ranging, but also know that this is impossible, especially at the cottage, where my hens spend hours in the woods or on the beach. I guess what I’m saying is I DO LIVE IN THE CITY and I need to co-exist with my neighbors. But… I am also trying to provide my hens with a natural existence and that includes “limited” free-ranging. If I need to clip some feathers in order to get closer to that “balance” than I feel justified in taking that road. Thanks for this post! I am debating about trimming wings now. I want to free-range my chickens on occasion in the dog run / garden area but I don’t want them leaving that area over the 4 foot fence, or getting into my raised bed garden which has a 4 chicken wire fence around it. Their chicken run is 6 foot tall and has hawk netting over the top so if they never left that area they wouldn’t need trimming. You helped to make the decision and make me feel better about trimming their wings too. I was concerned they would look ugly if I trimmed them and it might hurt…now I know different. Yes, I think its a great picture of you and Jill’s golden laced wyandotte too. Love the chicken hat! No need to trim if they can’t get out. The deal breaker for me was when Swiffer (that damn hen) would perch on our 5 ft. gate! She still likes to sit up on the deck rail, but the gate is now off limits. Chickens can be as stubborn as mules! I enjoy hearing about Swiffer, my husband and I were literally laughed out loud reading about her ‘Egg Song!’ Thank goodness we are allowed to have hens…and roosters! I wasn’t going to trim my girls feathers if they never left their run, but the dog run (shares a wall with the chicken run) would be so much fun for them digging through the weeds and eating all the bugs in there, but it is not covered in that area. Now if I can get the hubby to help me hold the big red hen down to trim her feathers. She really doesn’t like being held and he really doesn’t know a thing about chickens…great combination! Haha!